Hi folks, Doc here. This time we'll look at a set that, despite its size, is notable for several reasons. 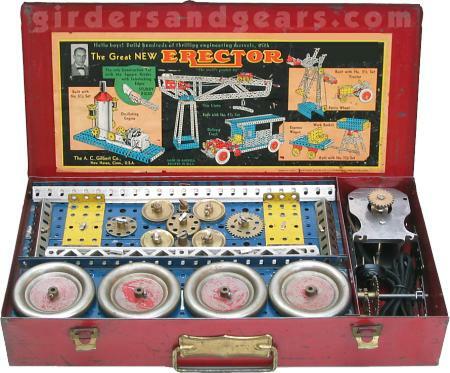 First, it was one of the earliest Erector sets to come in a metal box. Gilbert had made this major packaging change just two years earlier in 1933. 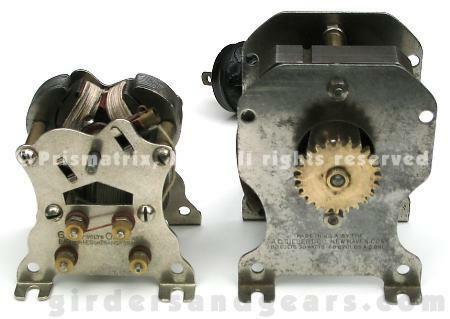 Second, it was the only set to contain the newly invented A52 induction motor, a (temporary) replacement for the P58 motor. Finally, it included a selection of the special skyscraper parts, also making their first appearance in 1935. 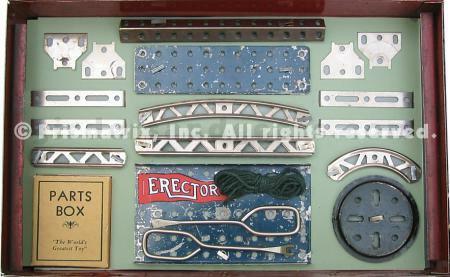 This was the only year that these parts were included in any Erector set other than the two Skyscraper accessory sets Nos. S and SA. The No. 4½ came in a red metal box measuring 16" x 8" x 3". Inside, the parts were arranged in a method new for 1935. With the new blue-painted MN base plates doing double duty as part trays, the majority of parts were stacked in two layers, the upper layer being MN trays and the lower a raised cardboard insert. A compartment on the right side of the box was used to store the new A52 motor and the motor gearbox. This gearbox was preassembled from two EI side plates, one gearbox base, and a variety of gears and axles. The particular set shown in the photos on this page was complete except for the motor when I acquired it. All the parts, as well as the manual, were original to the set. I wanted to keep the set intact, so I opted not to replace some of the rougher parts, in particular the MH wheels. At some point in its history, a previous owner had scraped off most of the red paint in the center of the wheels. I like these wheels in spite of it, because this early version of the MH is much heavier than the later versions that most of us are more familiar with. Not surprisingly, the lower cardboard insert and the part box were also missing, so I made reproductions of both pieces. I replaced the A52 motor to complete the set. 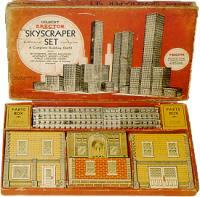 As I mentioned previously, Gilbert created the cardboard skyscraper panels in 1935, and two special sets - Nos. S and SA - to hold them. In 1935 only, a selection of panels were also included in all but the smallest of the regular numbered sets. 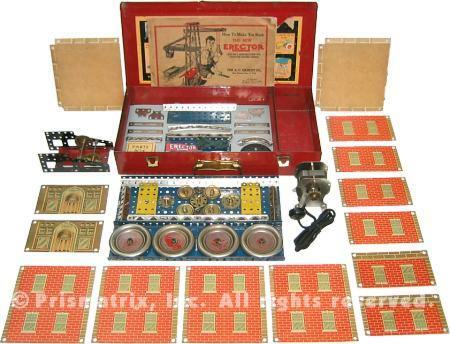 In 1936 and again in 1937, the last year for these parts, only the special sets were available. There were seven different panels in all. Each panel was made from thick cardboard and was printed on both sides. One side featured a red brick exterior, the other a cast concrete exterior. This effectively doubled the number of panels, allowing the builder to select a style of his or her choosing. Each panel had holes punched through it at the corners so that it could be attached to a framework made from angle girders. This was accomplished using special brass fasteners called snap rivets. 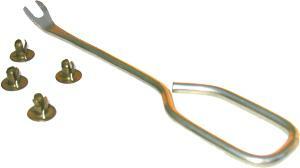 A special tool was provided to remove the rivets (see photo below). 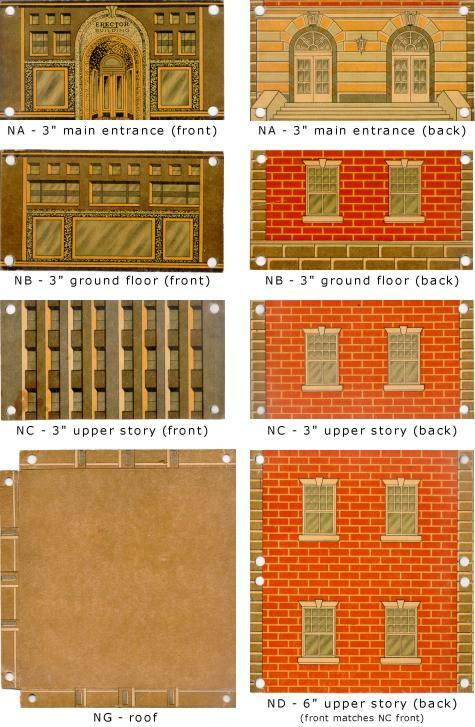 The 1935 4½ set included five of the seven panel types, a total of 14 panels in all (see the photo above). The five panel types are shown below.